Matt Petit/GettyBest actress winner Frances McDormand with presenters Jodie Foster and Jennifer Lawrence. 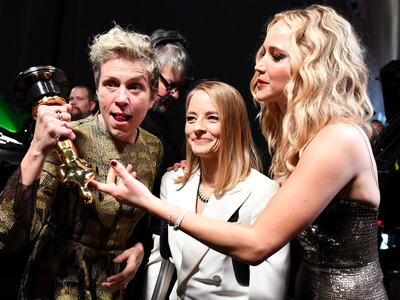 A man has been arrested after trying to steal Frances McDormand’s best actress Oscar award at an aftershow ball, according to multiple outlets. An LAPD spokesperson told Deadline that Terry Bryant, 47, is facing a charge of felony grand theft for allegedly stealing the Oscar. A man has been arrested after trying to steal Frances McDormand’s best actress Oscar award at an aftershow ball, according to multiple news outlets. A tweet from New York Times reporter Cara Buckley on Sunday provided further detail into the attempted theft from a then-unidentified man: Wolfgang Puck’s photographer apparently stopped the man from leaving the ball with the trophy. The man then “disappeared back into the ball,” after McDormand said to let him go. 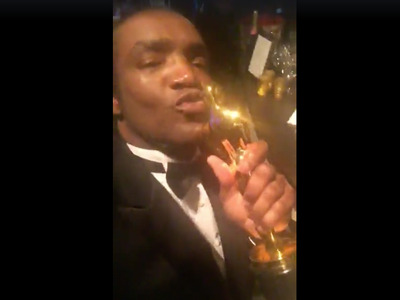 FacebookTerry Bryant, who allegedly stole McDormand’s Oscar, holds the trophy in a Facebook video. On Sunday night, a representative for McDormand confirmed to USA Today that McDormand was “happily reunited” with her trophy. “Fran and Oscar are happily reunited and are enjoying an In-N-Out burger together,” the rep wrote.